More work on comparatives so that you can become an expert. Comparatives are used very frequently in conversation, so it is best to get them right. 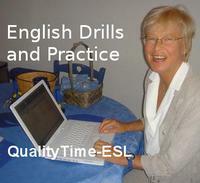 QT-ESL 27 "Comparatives Part 2"
Back to the main list of "QualityTime-ESL Podcasts."